The MultiGen M820-GM* series & M830-SM* series are compact 96 x 96 mm Din cased three phase generator monitoring meters. The M820-GM* series measure Active Power, Volts, Amps, Frequency, Coolant Temperature, Oil Pressure, Hours Run and DC volts. 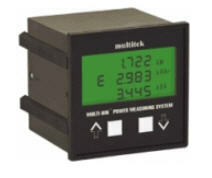 The M820-GM* also provides relay outputs for temperature and pressure set points. The M830-SM* series measure Active Power, Volts, Amps and Frequency. The MultiGen is designed to be user friendly and simple to use. All operations, including programming are performed by using the two push buttons on the front of the instrument. MultiGen units are pre-programmed by the factory and no further programming is necessary. However, a user can reprogram most parameters in a MultiGen e.g. nominal current and voltage inputs, relay output etc. The reprogramming operations are covered in the manual (see section 4). Phase voltage and current measurements are true RMS and the coolant and oil pressure are measured directly from the engine senders. Hours Run is timed using the generator frequency and DC volts measured directly from the battery. Directly connected voltages between 57.8 and 600V.